SAMUEL HUNTINGTON. 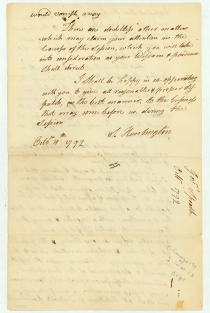 Autograph Speech Signed, October 11, 1792, [Conn.] 4 pp., 8 x 12¾ in. After his two years as President of the Continental Congress, and his brief service as first President of the United States in Congress, Samuel Huntington retired from public life, hoping to revive his law practice and fortune. Popular acclaim and unstable politics back home in Connecticut brought him back into the public sphere rather quickly, however. 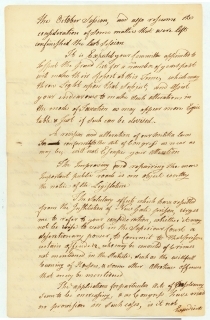 In 1784, he was elected Lieutenant Governor, a post which, at the time, made him Chief Judge of the Connecticut Superior Court, and which proved a logical jumping-off point to the governor’s office. Huntington’s election and subsequent popularity as governor was, as biographer Larry Gerlach argues, less a function of charisma and energy, and more a product of his desire and ability to stand “aloof from partisanship.” Like George Washington in many respects, his political career “was one of moderation and balance” (85). 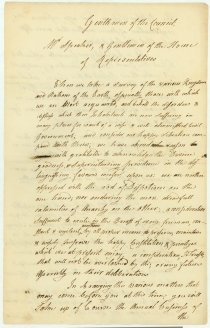 On the one hand, Huntington favored strengthening the powers of the national government and ratifying the Constitution, but he also jealously guarded the rights of Connecticut to its western lands on the basis of its colonial charter. During Huntington’s administration, Connecticut gave up its right to the northern third of Pennsylvania and to most of the Northwest Territory, but achieved recognition of its preemptive land rights in the “Western Reserve” (now northeastern Ohio). 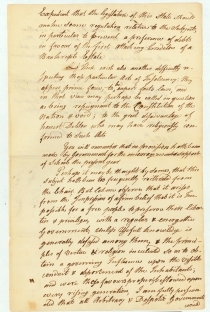 Connecticut’s fiscal status was strengthened by its ability to sell lands in the Western Reserve, and Huntington, while governor, ensured that Connecticut was well-represented at treaty councils with Indians of the Ohio territory so as to acquire lands by advantageous deals. It would seem that this document, then, has heretofore been unknown to historians. Its excellent content only heightens its value.